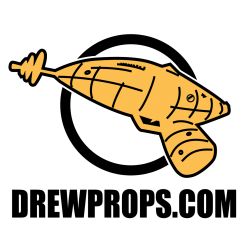 Slow times down here in Drewville. 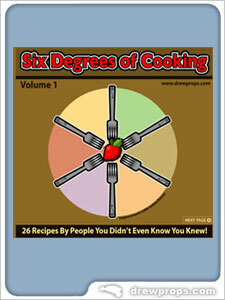 Slow enough that I’ve had time to complete the “Six Degrees of Cooking” recipe book, which you can download here. Thanks to everybody who had time to contribute a recipe. Please take a moment to flip through the PDF and see if you spot anyone you know…six degrees of separation and all. The cookbook is free, it’s small enough to email to your friends (736kb) and is for a good cause (contributing food to your local food bank). Send it along to anyone you know who might enjoy a fun recipe book! I attended a meeting of the Georgia Production Partnership to present the FILM-GA license plate concept to help spread the word to active producers in the Georgia film/video market. After the presentation I handed off a concept plate to GPP President Shay Griffin and Georgia Film & Videotape Commissioner Greg Torre…I’m hoping that this tag concept might become a piece of the program used to present a united front to the Georgia Legislature. I’m taking a turn at being a gardener this year, as my Dad finally gave in to the fact that you can buy cheap and tasty vegetables at the grocery store with absolutely no exposure to dirt, biting insects or perspiration. Since I’ve never planted or maintained a garden on my own I reasoned that if I had any questions, I could ask my Dad for his experienced advice. I think that he liked this plan even better than me because it meant that he could stand back and tell me exactly what I’m doing wrong….over and over again. What’s not to love about that? However, having watched years and years of his gardening incidents, I harbor little hope that many of the crops I’ve planted will survive the onslaught of hungry bugs and slugs. In late May 2002 I was contacted by Tripp Norton, one of the producers of the independent film “The Greenskeeper” to create a theatrical poster for the movie. Working from a basic composition requested by Tripp, I set out to create a movie poster that would provide an engaging color palette and help to convey the essence of the film to the casual viewer in less than ten seconds. The bad part was that I received all of the photographs for assembling the poster less than six days before the movie was set to premiere, so time was already against me. All told, I spent 42 hours working on this project. The final 300dpi Photoshop file came out at a whopping 480MB, and when opened it has at least 30 different layers which makes the file a beast to work inside. 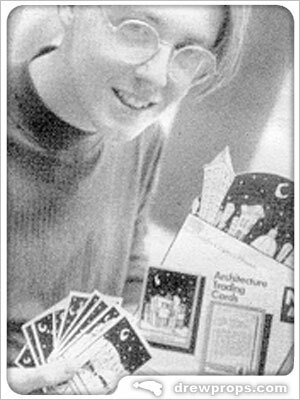 This is an article about me that appeared in the Georgia Tech Alumni magazine a year or so after I graduated from the School of Architecture. I look like I’m 12 in the picture. And a member of the band “A Flock of Dipwads”. I don’t know where my printed copy is and Georgia Tech’s online version doesn’t give a credit to the original author. So, this is an unauthorized reprint about myself.